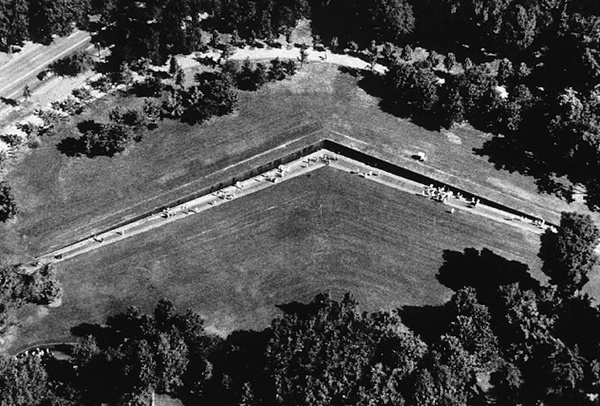 Maya Lin, “Vietnam Veterans Memorial Wall,” Histories of the National Mall, accessed April 25, 2019, http://mallhistory.org/items/show/63. The Vietnam Veterans Memorial Wall opened in 1982 to honor more than 58,000 American casualties lost in the Vietnam War. Two black walls form a wide V that list the names of each person missing or dead in chronological order. Diamonds appear beside names of the men and women killed, while the names of missing soldiers are marked with a cross. Kiosks near the memorial help visitors to locate names on the wall. Since it opened, visitors have left letters or other mementos for loved ones at the Wall. The Wall is 1 of 3 memorials honoring those who served in the Vietnam War.